When I was a kid, I dreamed of seeing space. Now I'm ready to make it happen, and I need your help! Most of us have big ideas when we're little, and not many of us pursue them. We don't really stop wanting them, we just give up. We focus on things that seem more practical, and eventually those dreams just don't seem so vivid anymore. While recording my latest album, I found myself thinking a lot about this idea, and I'm ready to try and follow my dream. 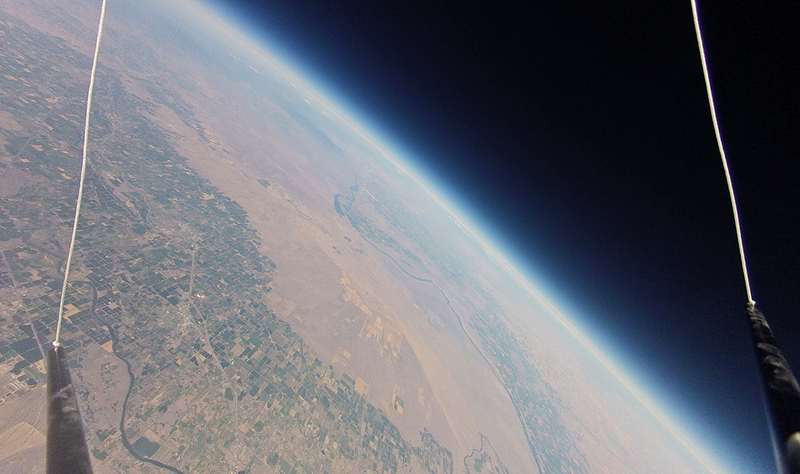 To see space, I'm going to attach a camera to a parachute and a weather balloon filled with helium. 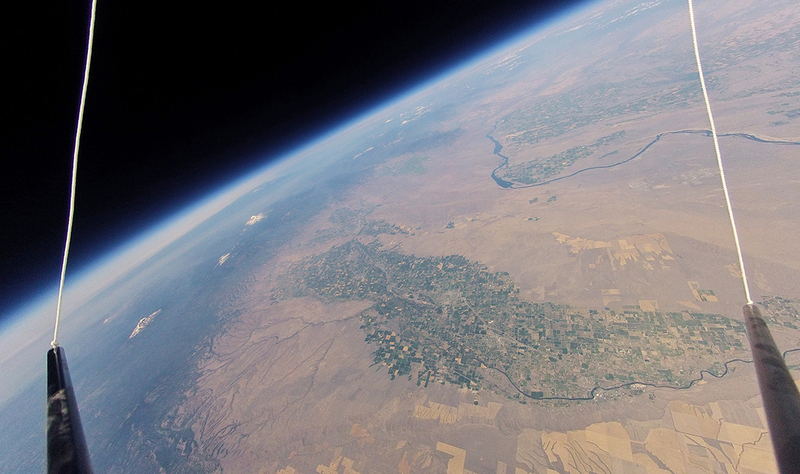 As the balloon rises to 100,000 feet, it'll expand until it finally pops and falls safely back to Earth. The camera, having recorded the journey as either HD video or a series of still images taken at regular intervals, will be accompanied by a GPS tracking device so I can find it once it returns. I want to encourage people to follow their dreams, no matter how crazy they may sound. Beyond that, though, space exploration is something I care deeply about. I think that knowledge of our universe is something that we can cultivate and pass down through each generation. It makes me sad to see politicians give up on space, and I want to help inspire a whole new set of explorers. Seeing the earth from above helps us understand how small and fragile our world is, helps us remember to take care of it, and shows us what we can accomplish when we work together. It's also just plain cool. Although there's a website out there that sells a pre-made kit for doing something just like this, it costs over $1800 when all additional expenses are taken into account. Just for being a part of the project, you'll get access to all of the raw footage and images. If you donate $20 or more, you'll also get a copy of my new album, to be released this summer. I'll also be posting news updates right here every step of the way, so even if you can't help out I hope you'll follow my progress and help cheer me on! I'm aiming for an early summer launch, right around my birthday, and I'm hoping to raise $800 total by then (enough for two launches: one recording 1080p HD video, and another snapping still images every few seconds.) And yes, this totally counts as an early a late birthday present. That's the plan. Will you join me? 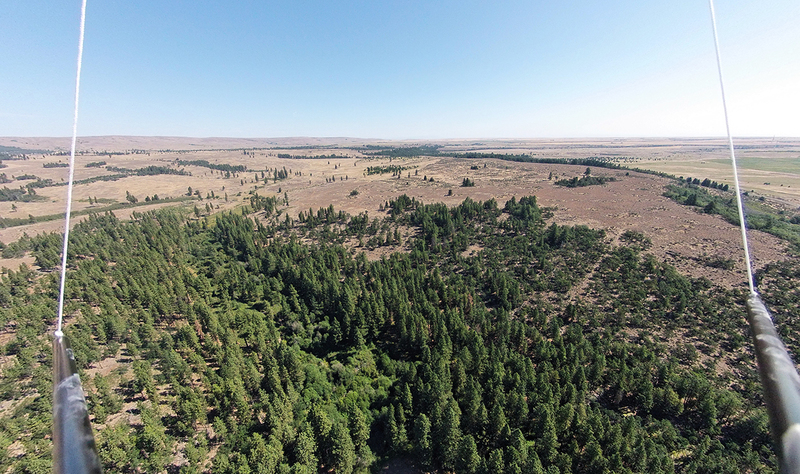 We launched on Saturday, August 10th, from a small park outside of Bickleton, WA. 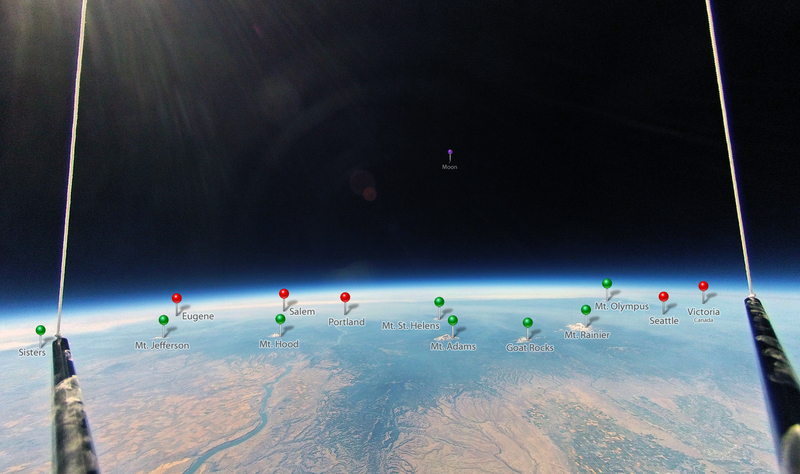 The launch site was chosen based on our projections using the Cambridge University Spaceflight Landing Predictor. We picked a spot with lower average wind speeds and where launching would give us a landing target with as much room for error as possible (i.e. not right next to a city, airport, or river.) We set everything up, checked it twice, and set the balloon free at 11:00 AM. Telemetry started coming in immediately, every ten minutes until 11:53, at which point the Spot GPS tracker stopped transmitting as expected due to federal regulations. After a very hot walk through the middle of nowhere, we found the payload—hot and dusty, but perfectly intact. The images look great (all 2,018 of them), and the timing could not have gone better. As a bit of background, there's a careful balance you have to find between initial volume, ascent velocity, burst altitude, and camera battery life (which can be less predictable in the extremely cold temperatures of the stratosphere). 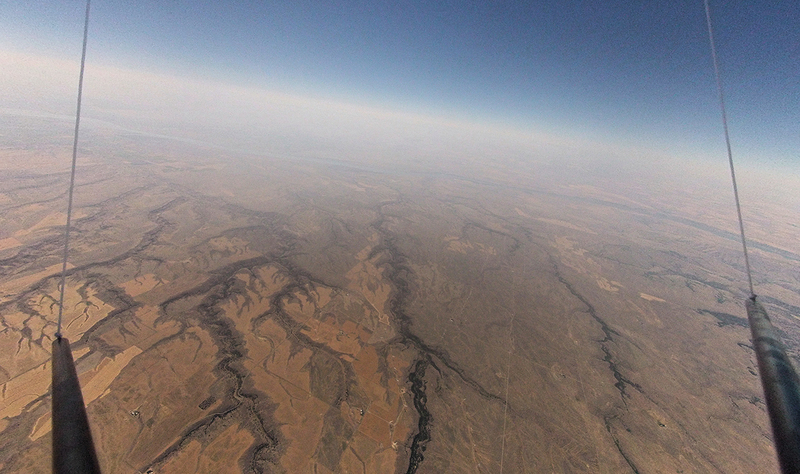 I didn't want to miss the highest altitudes, but I also didn't want to waste money on helium or cut the trip short only to get hundreds of blurry freefall pictures or a bunch of identical images from the ground after landing. So, how'd I do? 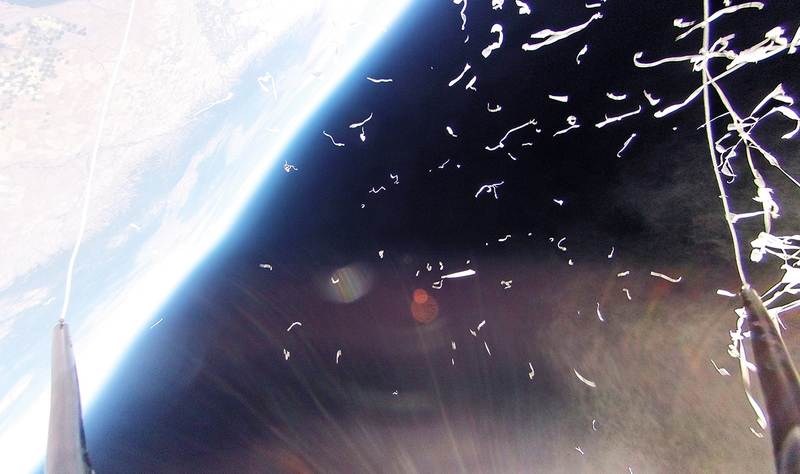 The balloon burst 168 minutes after launch, and the camera died seven minutes later. It couldn't have been more perfect. 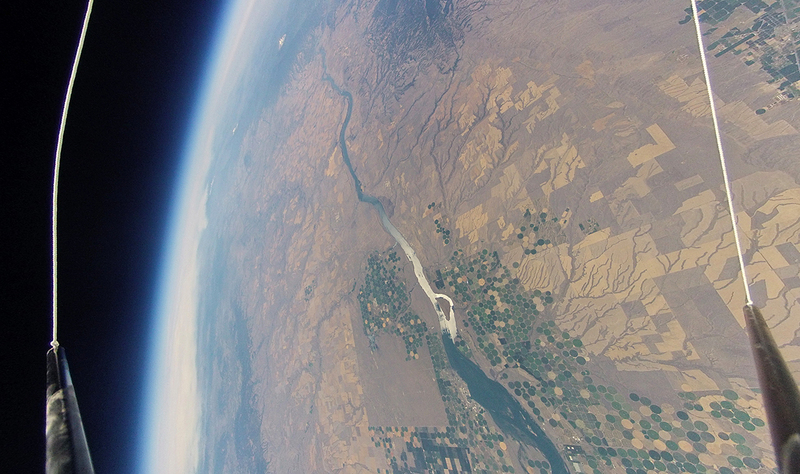 We don't have exact information, but the balloon easily reached 105,000 feet and could even have gone as high as 115,000! The descent took 97 minutes, and the whole trip took approximately 4:25, landing just over 40 miles from the launch site right around 3:25PM. It seemed early enough to do a second launch, but alas, the company who sold us the helium shorted us by a lot and we ended up wasting almost half of it when we realized that what was left wasn't nearly enough for a successful video launch. Helium isn't the most expensive part of the whole project, though, so we'll definitely be putting together a second launch later this year. In fact, we'll probably end up using Hydrogen which is lighter, cheaper, and renewable. So that's all for now, but a laundry list and set of instructions will come a little later should anyone else feel inspired to give this sort of thing a whirl. I have no doubt it'll go down as one of the best moments of my life, and I'm extremely grateful to all who helped me achieve it. One of the more exciting images brought back on Saturday featured a great view of the Cascades, spanning an incredible 500+ mile range from southern Oregon all the way up to Canada. If the camera had swiveled a bit to the left, it probably could've even caught the top corner of a cloudy California. I put together a map pointing out the highlights, with the moon hovering above. Pretty neat, huh? With the first launch down, it's time for some analysis! First, and most importantly: it turns out that several websites will rent out a Spot GPS tracker with service already set up, saving about $150. You can also rent a GoPro Hero 2 camera, making this sort of project dramatically cheaper. Just be sure to check their damage/loss policy first! Next, given the trouble that we had with our helium purchase, I think hydrogen is probably a better alternative. It's potentially flammable, but as long as it's not mixed with more than 4% oxygen and near a spark or flame, you'd be just fine. I'm guessing on the price difference between the two gases, so check local pricing to figure out if it's worth the risk or not. Finally, although the 32GB SD card would probably be necessary had we been taking video rather than photos, a 16GB is plenty for the 2000+ images we took in our 177 minute flight. If keeping costs down is critical, this is an easy way to save $15. The GoPro's fisheye effect can produce some pretty incredible but fairly deceptive photos (even curving the wrong way based on the angle.) To correct this, check out DxO Optics Pro 7 (for both Mac and PC, with a free one-month trial on their website.) 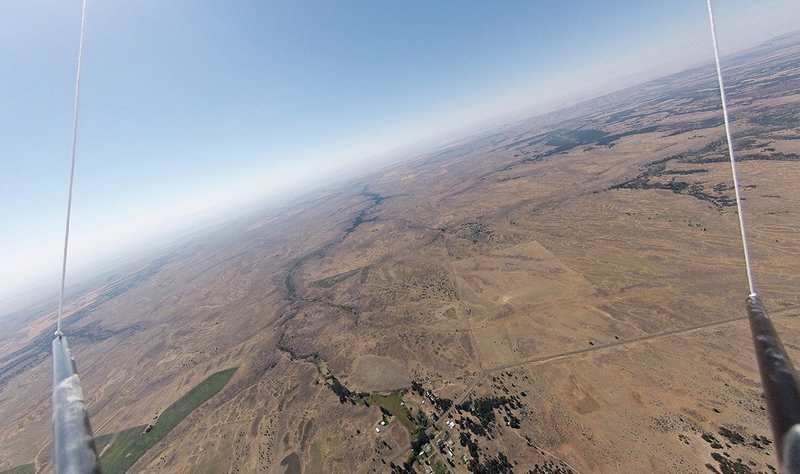 For 11MP 170° "wide" images, set the distortion type to Fisheye and set the intensity to 71. This program is quite intuitive, and you can apply a set of adjustments to as many images as you like all at once, so it's a HUGE time saver and works much better than alternatives like Photoshop. To be honest, I think I mostly got lucky on this one. There are so many variables that there's really no way to know exactly how high you'll get or how long your battery will last. I'll post specifics soon, but do yourself a favor and run plenty of recording tests in different conditions (in the freezer, even!) to see what sort of timing you can reasonably expect. I've just released two brand new iOS apps: Trail Share and Clouds Below. Trail Share is a mobile SPOT tracker that's great for this kind of project but works for all sorts of other adventures. 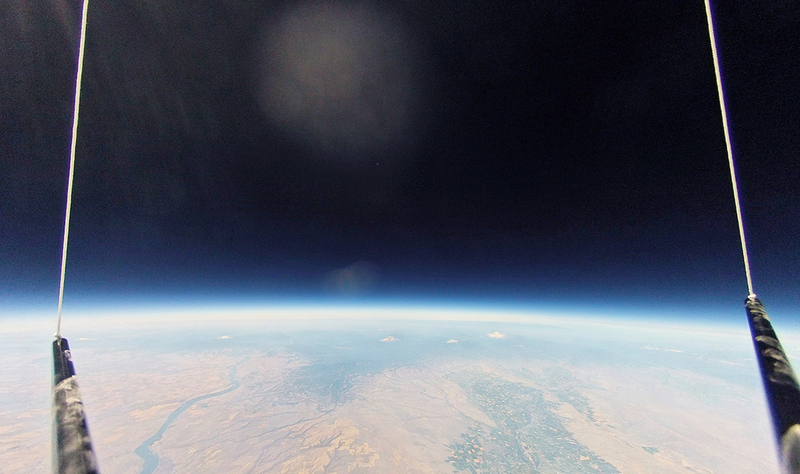 Clouds Below is designed specifically for high-altitude balloon flights and includes the same SPOT tracker, a burst calculator, and an extensive guide based on my own experiences. Be sure to check them out if you're planning something similar!